RIOHACHA, Colombia (CNS) -- It's midafternoon and the cemetery known as People Like Us is eerily quiet. As the corpse of Eduardo Sanchez is removed from a white funeral car and placed in a coffin, his daughter starts to sob and gets close to the coffin to take one last picture of her father. The rest of Sanchez's family watches from afar or turns away in sorrow. The stench and sight of the badly decomposed body are too much to take in. "He was in a morgue for four weeks," Sanchez's niece, Gisangie Navarro, explains. "But we come from Venezuela, and we did not have enough money to take him anywhere. Now he can finally get a Christian burial." As hundreds of thousands of Venezuelans migrate across South America to escape hyperinflation and food shortages, some are dying in poverty far from home. Can Colombia's Displaced People Get on the U.N. Agenda? 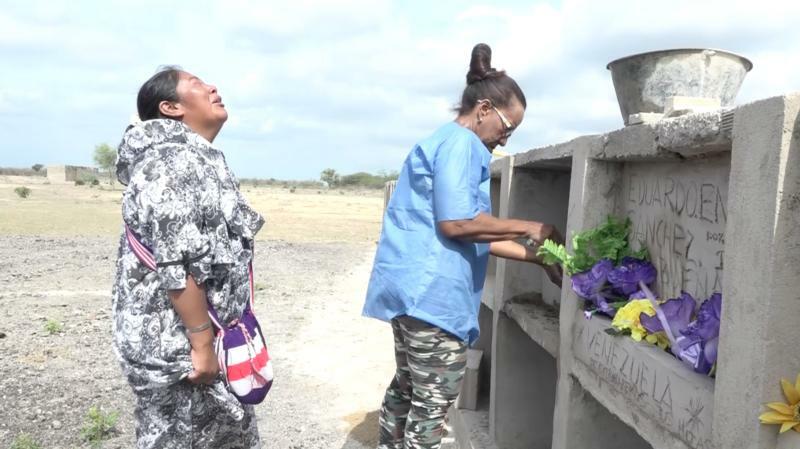 A small cemetery in Colombia's northern La Guajira department has become a haven for the corpses of these dead migrants and is helping their bereaved families to find some peace and comfort as they struggle to get by. The cemetery also has helped a retired coroner find her calling, as she undertakes a task that few aid groups have contemplated. "God has a purpose for all of us," says Sonia Bermudez, the coroner and founder of People Like Us cemetery. "And my job is to take care of the dead, and make sure that everyone gets a decent burial." Bermudez says her interest in working with the dead started at age 13, when her father was the security guard in her hometown's public cemetery. In those days, she recalls, bodies that were not claimed by anyone were buried in large pits without coffins and often with no clothes. Sometimes, officials put a bag over the corpses' heads to give the burial a small sense of dignity. "I thought it was very unfair how these people were buried, in comparison to folks who had families that paid for funerals," Bermudez says. "So eventually I decided to get involved." At 15, Bermudez was assisting the local coroner in autopsies, and she started to bury unclaimed bodies. Then, after studying forensic sciences in Colombia's capital, she returned home to practice her craft. Eventually, she started the cemetery that has become her life's work. "There were always bodies in the morgue that no one was claiming," she explains. "So, I started to take them to a plot of land that the municipal government was not using, and I buried them there." Initially, Bermudez buried mostly homeless people who no one claimed. Then, as violence between guerilla groups and rightwing paramilitaries engulfed her province of La Guajira, she started to bury the corpses of war victims dumped in the desert outside her hometown of Riohacha. Colombia eventually became less violent, and a 2016 peace deal between the government and the country's main guerilla group helped to further diminish the country's murder rate. But Bermudez's cemetery is as busy as ever. The forensic scientist, now 64, spends most of her time now burying Venezuelan migrants who have died in poverty in northern Colombia. Bermudez says so far this year she has already buried 30 Venezuelans, free of charge. After putting the dead in simple coffins purchased by donors, she places them in rectangular cement crypts that bear their names and are decorated with synthetic flowers. "When these (Venezuelan) families come to me, they are in a very precarious situation," Bermudez says. "Some barely have enough money for their own food, and often they are traveling from other cities and they have nowhere to stay." Bermudez has had to spend her own money to help bury the large numbers of destitute migrants who have died in Colombia recently, but she says no one else in northern Colombia is providing a similar service. A separate municipal cemetery, managed by the Catholic Church, charges fees of at least $100 for burial spaces, and coffins start at $200. Those amounts are unaffordable for migrants, who usually make about $5 a day. "The priests and the funeral homes always need to charge something," Bermudez says. She adds that most people at her modest cemetery are buried without a religious ceremony, "because priests charge for that, too." Bermudez says she is sure that God is helping her out in her "mission." She recently got construction materials from the U.N. refugee agency, UNHCR, so she built more crypts for her cemetery. The agency also helped her cover the costs of transporting the corpses of dead migrants to her graveyard. "When I do this, I feel full of peace and tranquility," she says. "I feel that I am helping to fulfill God's will."